There are a thousand and one ways to decorate a wedding – and the beautiful thing about planning the perfect wedding décor is that you can always combine multiple themes and elements to create something that’s truly unique. Something that reflects you, your fiancé, and who you are as a couple. Macramé décor is one of those trends that slowly makes room into your heart, the kind you really want to incorporate at least in a small amount into your Big Day for a touch of homespun love. How can you do that? We have some ideas for you – so read on if you are looking for inspiration. · The chairs. One of the easiest and most beautiful ways of adding a bohemian touch to your wedding is by decorating the chairs with macramé. You don’t have to cover the entire chair; you could only limit yourself to the bride and groom’s chairs if you wanted to keep it low-key. 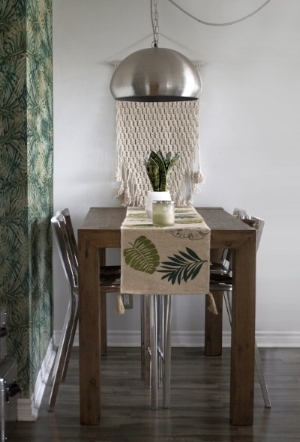 Even a simple macramé model hanging on the back of your chairs will work some magic. · The backdrop. Want to add a very boho-chic touch to your ceremony? Create a woven macramé backdrop to place behind the altar. It will set the mood for the entire ceremony and show off your creative talents! · The cake. Not sure how to decorate your cake in an original way? A small cake skirt made out of fondant “worked” as macramé will look really special. This works marvelously for any wedding with a bohemian, garden, or other nature-inspired theme. · The bar. Your bar or candy table has to coordinate perfectly with your bohemian wedding theme – so why not decorate the table with macramé? Choose white macramé for a cleaner look or go for ombre macramé that coordinates with your wedding colors for something more festive. Either way, this will look really pretty! · The bouquet. Wrap your bouquet in macramé if you want to make it look bohemian with a touch of vintage – even a simple bouquet of white roses looks beautiful with woven art around the outside. This could also be your “something old;” if you have any macramé décor that has been passed down as a heirloom, it’s even better! Looking for the perfect wedding specialists in New Mexico? Contact New Mexico Wedding Expos & Guide and allow our exhibitors to help you plan your dream wedding.